From the end of 2013, all the Laser Embedded Laser Harp we craft, are classified as Class IV Laser devices. 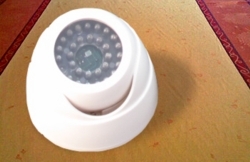 This means that they follow safety standard, which we applied also in the old Class 3b products in the past. Even if it was not required for 3b classes. On top of all, they must be used only from specialized person and/or the musician that has to play with, must be very careful and read out, understand, all the Safety recommendations are written also on the Manual given with the devices. Her/his behavior is expected to be very strict to what the Manual declares and even more severe than it, but certainly not lighter than that. Taking into consideration that our Laser Harps are Musical Instruments and not devices that should be used for other purposes than this or in dangerous environment (e.g. with explosive gases etc), the safety systems installed, should be able to protect the personnel, and at the same time permit the use tf the Laser Harp in the goal they are designed for. All the parts of the laser Harps which are hazardous, are clearly signaled by conventional/standard labeling placed just aside that zones. Please take care to these signalization/labeling and respect them carefully. Those labels and the danger notes are also reported into the manual. In all the nations of Europe (EU), there is the application of what is called "Common Sense". To enforce this, we seriously declare here that's strongly forbidden for any user, to open the device for any reason. The opening of the device, is admitted only by Laser technical Specialist personnel. We strongly encourage you to send your Laser Harp, in case you need any reparation's intervention, directly to our Laboratories. We are not responsible about any damage against persons/animals/things, if you violate any of the requirements expressed above, hereby, and into the manual. Laser beams must never be pointed toward any reflective surfaces, that can point them toward the eyes/body of any living being. In case of white Ceiling, we always suggest to put a black tape or not reflective surface, in the ceiling's zone where the lasers are pointed. We are selling the tape in our Accessories section. On stage, take care that laser are going directly into sky or they are not reflected by any surface like the scaffold or else. If you use the SkyCeil to create the spectacular Laser Ceiling, you are responsible to prevent that the deflected Laser Beams, are hitting any living being/reflective object. This manner to use the projector, suggested or indicated by other companies, is very dangerous. Indeed a simple misalignment of the mirror, due small accidental movements on the Stage or else, can hazard the eyes of the public. Each Laser Harp, with laser projector embedded, have a Keylock system, that interdicts the device in case the key is not inserted and turned. Who has the key, is the formal responsible of the use of the harp. The remote interlock connector Class 4 lasers should be connected to an emergency master disconnect interlock or to room, door or fixture interlocks. Safety norms are just describing the requirement to have a keylock. We did more. Since the beginning, we have enforced this requirement, applying the necessity to press contemporaneously the pedals 1 and 4, to activate the lasers. This, together with the keylock, avoids accidental turns on, by personnel which is not supposed to have access to the Laser Harp, nor to it's use and handling. Light weight instruments, can by tilted down/flipped by rough use (by a strong kick for instance). While the heaviest ones, due an not attentive use during the setup of the stage. It means that there is the risk that the laser beams are reaching the eyes of any the people and this must be avoided. Norms are prescribing the interlock system, which deactivates the lasers by disconnecting a plug or pushing an emergency button. The interlock foreseen by norms has a dangerous drawback: it takes too long to be activated, and lasers are damaging eyes in milliseconds. To be more effective than what norms are suggesting, our Interlock system is a tilt sensor. 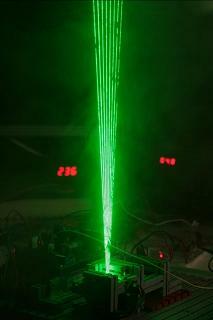 Indeed our laser harps must be used with lasers coming out upright, in vertical! For the reasons above, if ever the Laser Harp is bumped, with risk of tilt, and/or tilted the laser system and the whole circuitry goes immediately off, avoiding any accidental possible contact with the eyes of any body surrounding it. At the same time an acoustic alarm turns on and the only one way to reset the Laser Harp restarting the lasers, is to put the laser harp in its working position, as foreseen by its Manual, to unplug and re-plug the power by the mechanical switch. This solution is much more effective and quick than any pushbutton in the world, and it's meant to protect you much more. In certain cases, especially when the Laser Harp is more portable, thus subjected to be easily handled by not so expert personnel, there is a cover with 2 locks. Closing it when the instrument is not used, as recommended, with the keys we give when we ship the laser harp, prevent access to the harp itself. Goggles are special protective glasses. they are NOT Sunglasses, thus please do not make any confusion amount the two types of glasses! Goggles are made with special lenses that are attenuating only a specific wavelength. Moreover they are not meant to protect you against long direct contact between your (or third parties) eyes and the lasers. They are meant only to protect against brilliant reflections of the lasers (accidental hits) which can accidentally reach your or third parties eyes. moreover, goggles are generally made to protect against one specific wavelength, thus only one color. To protect your eyes, be attentive, careful and applying your common sense. Laser Harp: is what you are looking for? The ones we craft, are the ultimate and portable ones!! Let's explore their main features. 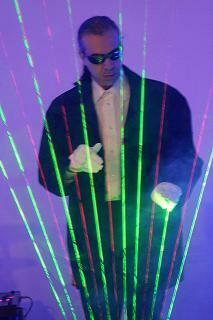 Maurizio Carelli is the creator of all the Laser Harps you can see in this website! Since his childood, Maurizio Carelli is a great Fan of the French musician: Jean Michel Jarre. You know the Laser Harps of Maurizio Carelli and you know Kromalaser. But artistically talking: who is Maurizio Carelli? He’s not only the creator of Kromalaser‘s Laser Harps. He has also a quite great experience and career in the Musical Sector. Here below the summary of his Curriculum. 1993-2000 – Created the National Match “Primo Traguardo” for interpreters. As Record Producer, he’s being director of Regson Studios in Milan (italy) where prestigious National Artists recorded their Records as: Fabrizio de André, Milva, Natale Massara, Pino Donaggio, Elio e le Storie Tese and several other ones. Maurizio was the founder of Rima Records and Unigroove Records. He had artistic collaborations with Raffaella Destefano, Nello Daniele and other ones. 2008-2009 – As Composer and Arranger, Maurizio was working with the musical project “Fogne” by Cristina Barnasconi. We designed several models with laser embedded as well as ILDA Controllers. The Laser Harps Kromalaser are amazing musical instruments, that will lead your performances into the magic of light and sound. Just plug your Laser Harp into your Synth or PC and play. Feel the sound of the light in your hands! 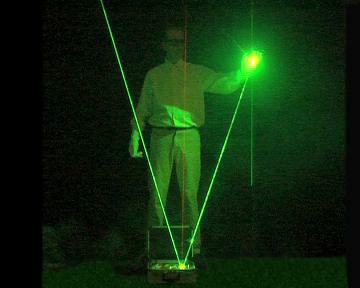 In other words: a Laser Harp is a “cordophone” whose strings are made by light beams. Kromalaser's Laser Harps are industrially crafted devices that make them into the most powerful, portable and flexible Laser Harps ever made. No matter where your gig is, your living room as well as on stage. Having an unframed structure, the laser beams of these Laser Harps can be projected to the sky creating spanning up to 2km (6 562 ft) high with min. 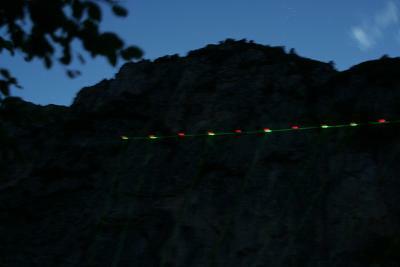 300mw green laser power and in skyclear conditions. You can also reflect the light beams and create a gigantic Laser Light Roof above your astounded audience, by tilted mirrors reflecting the rays through: SkyCeil! 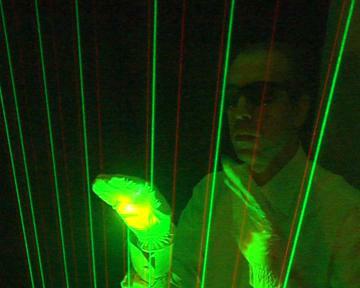 Wear your white gloves, touch a laser beam. The light sensor UltraSENSOR™ intercepts your hand position and the matched MIDI note code will flow straight into any MIDI instrument through the MIDI-Out port. All KROMALASER's Laser Harps are designed to drive any kind of electronic or virtual instrument (VST). Activate sequencers, dim lights and anything your creativity brings forth: you can do this all by touching a pure laser beam. Your Performance at the first place! From 1000mW up to 6W standard and up to 100W on request. Great power for terrific, gorgeous concerts, for any kind of audience. Nobody can have more! Even Jean Michel Jarre could dream for it. Already from the basic model of the Laser Harp KROMALASER , the power of the laser beams is enough to be seen very far away. In the picture aside you can see the laser beams to the top of a mountain 2km (6 562 feet) far, in SkyClear night condition. The Story of KROMALASER's projects starts on July 2008 when Maurizio Carelli wanted to design and build a low cost laser harp that can be easily transported and can be easily played on stage. Something which is definitely easy to use by everyone. The only one way to achieve this goal, was to design a device which is exactly on that way. The first prototype of Laser Harp was made with the tool FischerTechnik (a “Lego like” toy). This was used to build the main support. It was just the begin of the great adventure toward real professional devices. A special testing board was built in order to measure: beams aperture, laser power and sensitivity calibration. Honestly, the most difficult part of the Laser Harp project, was the hardware engineering. The engineer Ceresini, worked hardly on 3D C.A.D. in order to design the final mechanical support. The very first Kromalaser’s Laser Harp has been really hand made. 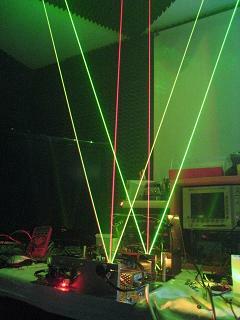 These processes carried the Laser Harp to the final stage. A very rugged, reliable and powerful system for your performances on Stage. 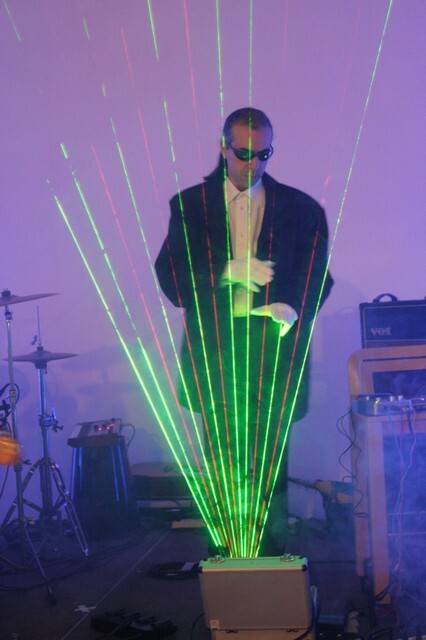 After months of testing, the Laser Harp have been used on Stage, in an official performance taken on February the 27th 2010, during WIRInMilan show. At that point in time, Mr.Carelli made the very first official Kromalaser's website, to introduce you this great device! In 2010, due an important meeting with one of the most known italian musician, producer and DJ: Roland Brant, a definitive improvement to the Laser Harp has been made, making the Laser Harp KL Professional to coming to life, The improvement is: the UltraSENSOR. The UltraSENSOR makes possible to play the Laser Harp even in daily light or with stage's artificial lights. On July 2010, after this achievement, Maurizio Carelli designed and crafted the ILDA Controller which was called: KL-Kontrol. By this ILDA Laser Controller, it’s possible to create Laser Harps just by using all the Laser Scanners on market. The big advantage of KL-Kontrol, is that’s possible to create Multi-Color Laser Harps, with a great variety of optical effects. The KL-Kontrol was followed by the KL-Dee Jay, with which the Laser Harp could be driven by a Synth or a PC. Both KL-Kontrol and KL-Dee Jay, were the very honored ancestors of the actual KL-KONTROLITE in all its variations. In 2011 it was started another important project, which was introduced on market in 2012: KL-3D "EXTREME" which is the very first 3D Laser Harp in the world! With the 3D EXTREME, the Laser Harp world is bound to have a dramatic change, making all the conventional Laser Harps in the world market: obsolete! Kromalaser continues to improve its products and enhances its catalogue to offer you the best Laser Harps ever. 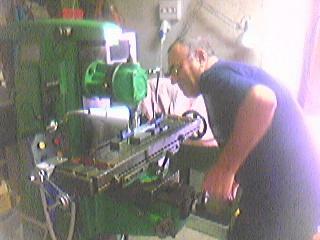 Mr. Ceresini milling the hardware of the laser beams' mixer. Tiziano DEMARIA – English/italian Translations, Website design & programming, graphics, info-graphics realizations, voice-over, IT and Program Management. Privacy protection is very important to us. Whenever we ask for personal information from you, we always explain why we need such information. We will always ask for your consent before collecting and processing information about you. Of course, you can withdraw your consent anytime by sending an email to: info@kromalaser.com. We will then immediately delete all your information. Personal information is any information that is used to identify a particular person, i.e. 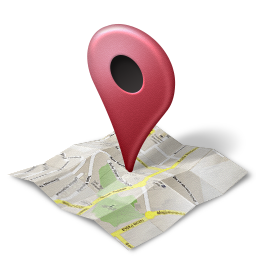 it can be a name, address, telephone number, email address and so on. We will only use such information when we are legally allowed to or when you give us your express consent. European Data Protection Regulations allow us to collect, process and use your personal data as long as it is required to enter into, define and change contracts in relation to this website and the services offered therein. This applies to situations in which we are required to use your personal information in order to provide you with the services we offer at our website. Of course, your personal information will not be shared with anyone other than KROMALASER affiliates and contractors who assist KROMALASER in these efforts (e.g. by saving data for us) and are bound to confidentiality. For the avoidance of doubt, these affiliates and contractors may only use your personal information for the sole purpose of assisting KROMALASER in providing the services you applied for. When you are visiting our Site, you may be asked for your personal information to allow you to participate in prize competitions, answer our questionnaires or inquiries by e-mail or through the Site, register as a KROMALASER user, monitor KROMALASER Products, or e-mail news services concerning the KROMALASER product lines, etc. When we collect your personal information, we reasonably specify the purpose of such collection. Any personal information that you provide will be used to meet your request such as forwarding brochures, magazines, etc. and offering certain services. We may also use your personal information to contact you regarding other products and services that may be of interest to you, you can send your request to: info@kromalaser.com informing us to limit our contact with you to the express purpose that you provided your personal information for. law enforcement, judicial authorities or other governmental officials for legal proceedings, fraud prevention, investigations into illegal activities or as otherwise required by law. other business entities, should we plan to merge with, or be acquired by that business entity.